Strong as Steel Adaptive Sports is an organization dedicated to providing recreational and competitive sports opportunities for children with physical disabilities in the Western PA region and beyond. On May 4th, nine athletes affected with a variety of physical disabilities competed in Track, Field and Fun Day! For many of the athletes, this was their first exposure to track and field. The courage of these kids to come out and try something they had done before was impressive to say the least. 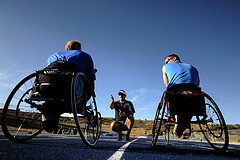 Track, Field and Fun Day used a classification system similar to the one used by Wheelchair and Ambulatory Sports USA (WASUSA), where athletes are classified based on their age and type of disability. For example there are eight classes under the main class of cerebral palsy so that athletes are competing with peers who have very similar disability. This allows for a more even playing field for all athletes. In the case of Track, Field and Fun Day, only two of the nine athletes had a person the same gender, class, and age group as themselves. The other seven athletes were competing against themselves, trying to break or set personal records. Of course this also made them all shoe in’s to sweep gold in their age and disability categories, but they didn’t know that! Organizers planned a day that offered a variety of traditional track and field activities with a few events sprinkled in just for fun. The goal was to provide a fun, free day, to get kids with disabilities interested in track and field. The catch phrase for the event was “no experience necessary” and this was embodied through organizers providing coaching tips at each event as the kids rotated through them. The athletes participated in races ranging from 20 meters to 200 meters with the 60 meter and 100 meter in between. Before each race they were taught about the importance of staying in there lane, getting a fast start off the gun, and racing through the finish line. All the athletes looked fantastic on the track, impressing all present with their spirit and determination! The kids also learned to throw a javelin, a shot put, and the discus. The ambulatory athletes gave long jump a try. Brooke Whitlinger began her long jump trials with face plants and wound up soaring. Despite several mouths full of sand, Brooke never gave up! Besides the traditional track and field activities, the organizers sprinkled in some activities just for fun. The athletes played a game of body bowling where they got to knock down “pins” with their chairs or bodies. As a special treat, all the kids were also given the opportunity to play a round of mini golf on the fantastic course at Robert Morris University. At the conclusion of the event, Brooke Whitlinger and Kelsey Hatt had to split the gold and silver medals between them, being the only athletes present with competition on the track. The rest of the group all earned straight gold medals for each event they participated in. Kelsey won 2 gold and 5 silver medals, and she was absolutely thrilled to receive them. She whispered a barely audible “yes” while flashing a huge grin when she was handed her bling! All the athletes had fun and learned about the sport of track and field, so organizers agreed it was a successful event. However, a few triumphs stand out as worth mentioning individually. Darrion Allensworth, one of the more seasoned athletes on the team, learned to throw a discus thanks to the help of coach Lea Eidenshink who volunteered at the event. He has decided to add this to his roster of events at the upcoming Ohio Wheelchair Games. Trent Clayton jumped a personal best in the long jump, beating the national record he set at NJDC last year. And Brooke Whitlinger has, after coming out to this event, decided to join Strong as Steel Adaptive Sports at the Ohio Wheelchair Games in June. Congratulations to all of the talented athletes for coming out to try something new, for your efforts, for your amazing spirits and positive attitudes!